Vacation Bible School at First Reformed is always the first full week of June. This year, Bible school will be held June 3-7, 2019. Our Bible School theme this year is "ROAR". Bible School at FRC is for children 4 years- 6th grade. Bible School begins each night at 5:30 pm. A meal is provided to everyone. Bible stories, crafts, singing and a time of fellowship happens each night. Our night ends at 8:30 pm. 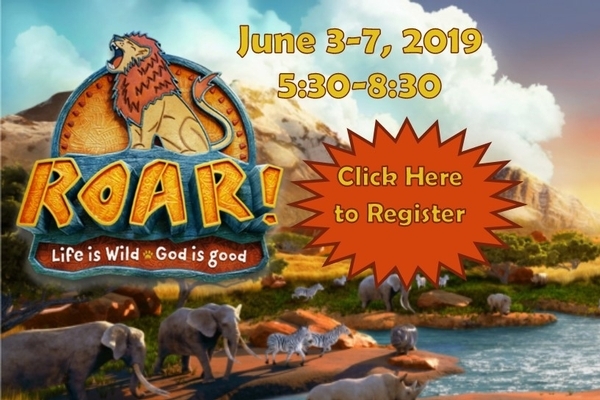 On Friday night, the last night of Bible School, all parents, grandparents, and friends are invited to hear a summary of what their child learned during the week as well as hear Bible verses and songs the children have learned throughout the week.